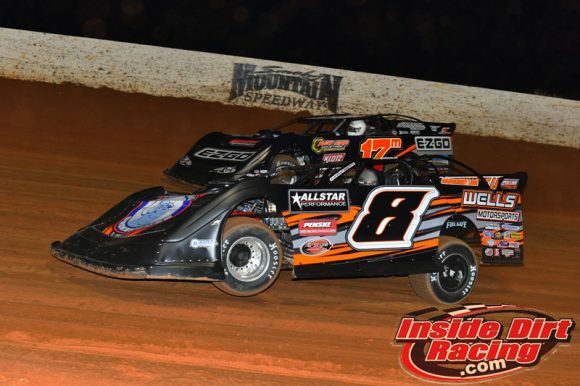 The Spring Nationals mini-series rolled into Smoky Mountain Speedway on Saturday night to contest a $10,000-to-win feature race. 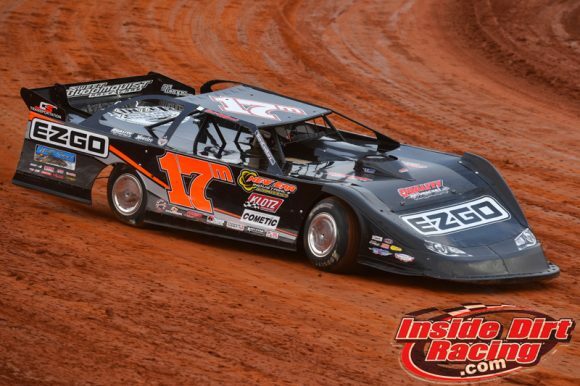 And when all was said and done, one of Dirt Late Model racing’s hottest drivers came away from the Maryville, TN facility with a $10,000 check and the leadership of the Ray Cook-promoted series standings. 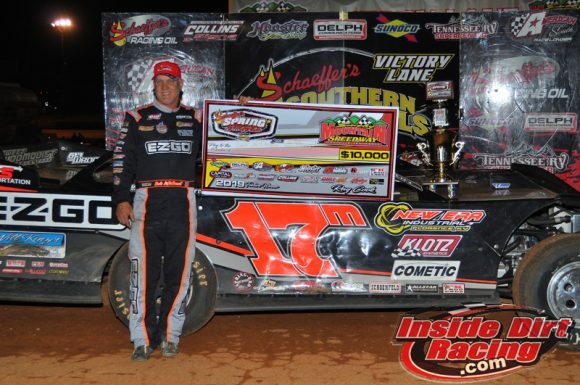 It was the Chickamauga, GA driver’s fourth victory of the 2019 season. Open Wheel Modified ace Kyle Strickler, driving a Late Model from the Eric Wells camp, set the fast time in Group A qualifying with a mark of 15.811 seconds around the 4/10 mile clay oval to beat out Michael Chilton, Robby Moses and Vic Hill. Donald McIntosh was quickest in Group B time-trials and overall with a lap of 15.810 seconds to better the efforts of Ross Bailes, Dale McDowell and Brandon Overton. Strickler would start the feature from the pole by virtue of his win in the first heat race of the night ahead of Robby Moses, Tommy Kerr and Bobby Giffin while Vic Hill won the second preliminary of the evening over Michael Chilton, David Payne and Joey Coulter. McDowell earned a front row starting spot in the feature by taking the win in the third head over Ricky Weiss, Donald McIntosh and Ashton Winger just before Brandon Overton won the fourth and final heat of the night by beating out Ross Bailes, Dakotah Knuckles and Chicky Barton. McDowell immediately shot to the lead of the 50-lap feature when the green flag waved with Overton, Strickler, Hill and Weiss inn his tire tracks. Bailes, who won the Lucas Oil Late Model Dirt Series feature at 411 Motor Speedway just over a week ago, challenged Chilton for third on lap 3 and was successful in taking that spot away. In the early laps the top-5 of McDowell, Overton, Strickler, Hill and Weiss ran in tight formation as they set a blistering pace during the opening laps. However, a lap 6 caution for a flat tire on the Ryan Crane machine slowed the action briefly. On the ensuing restart, Bailes made his way into the top-5 while Tommy Kerr and Hill fought over the sixth position just behind Bailes. 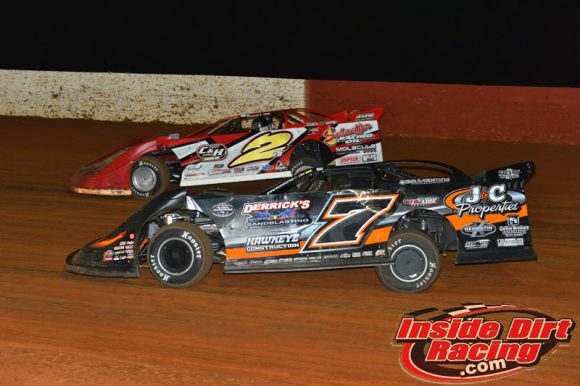 In the meantime, those running close to the front broke into two separate three-car groups as McDowell, Overton and Strickler continued to show the way while Weiss, Bailes and Hill offered pursuit. Overton passed McDowell for the lead just before a lap 17 caution flag waved for the slowing car of Chicky Barton. Because the lap had not been completed prior to the waving of the yellow flag, Overton’s pass for the lead was negated and McDowell was placed back at the front of the pack. Strickler attempted to take second away from Overton on lap 20 but instead fell back into the clutches of Weiss who eventually took the spot away. The final yellow flag of the night waved on lap 21. On the restart, Weiss moved to second with Kerr assuming the fourth position. Between laps 30 and 32, Overton and Weiss engaged in a hard charging exchange of slide job passes as the two would swap the runner-up position with each set of turns with Overton eventually staking claim. Over the final laps, McDowell continued to lead but his car was never separated from second running Overton by more than a couple of car lengths while Weiss was never more than a couple of car lengths behind Overon. But neither could muster the strength to move around McDowell, who took the checkered flag as the leader for the fourth time this season.